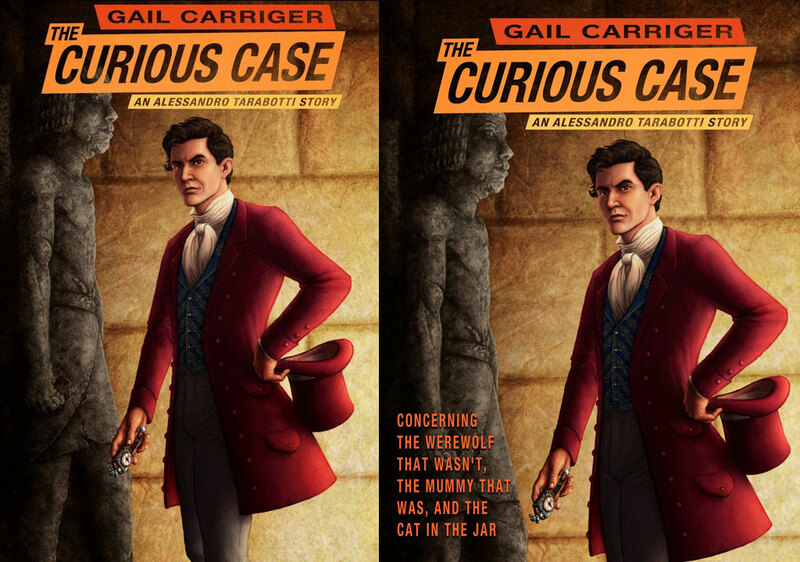 Today I’m taking a look at the creation of the cover for Gail Carriger’s ebook The Curious Case. Back? Okay, on with the show! As Gail mentioned, she approached me about doing the cover. 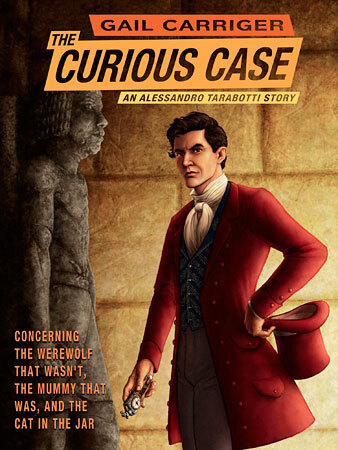 I was delighted by the idea because – while I don’t get as much time as I would like to read – I had thoroughly devoured the Parasol Protectorate series featuring Alexia Tarabotti. Intriguingly, this cover was an opportunity to paint her father, Alessandro, a figure who never appears in the books but whose history and reputation are a constant backdrop to the series. I read through the story several times. The first time to simply enjoy it, and the other times to make notes about scenes (foreground and background), characters, and most importantly what Alessandro was wearing. Alessandro masquerades as a fop but his love of quality clothing is no charade. Then, I discussed the options with Gail and we settled on what we both felt was the best scene to depict because it evoked Egypt and was a good moment for a “hero shot” with the added bonus of nice warm lighting. The lighting in the scene is supposed to be torchlight but I had to cheat and make the scene brighter to give it a good readable thumbnail for the ebook sites. 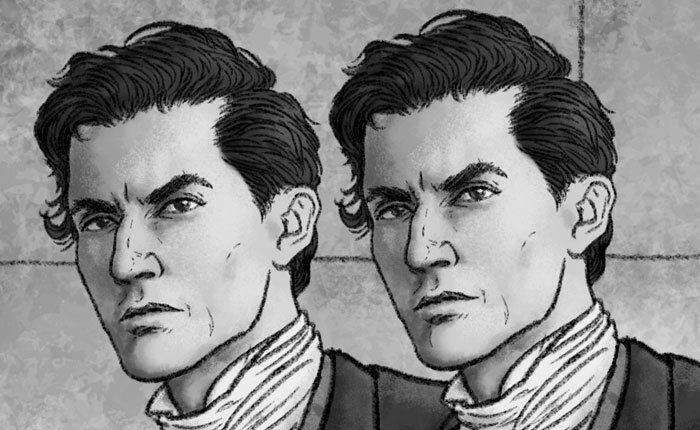 While an image with heavier shadows might have been spookier it would have denied us our one good look at Alessandro and it would have been out of step with the style of the paperback covers. Given that, why are there no torches in sight? Well, one is carried by a character who stands roughly where the viewer is and the others are along the passage casting that strong light on Alessandro’s side. The decision to not include a torch in shot was for clarity and (hopefully) elegant simplicity in the composition. The viewer understands there are sources of illumination without having to drag their eyes away from Alessandro and the looming Ka statue. Speaking of the Ka Statue, in addition to the many things that Gail explained to me about ancient Egyptian burial customs, I discovered that the statues obey a strict “six heads height” rule. 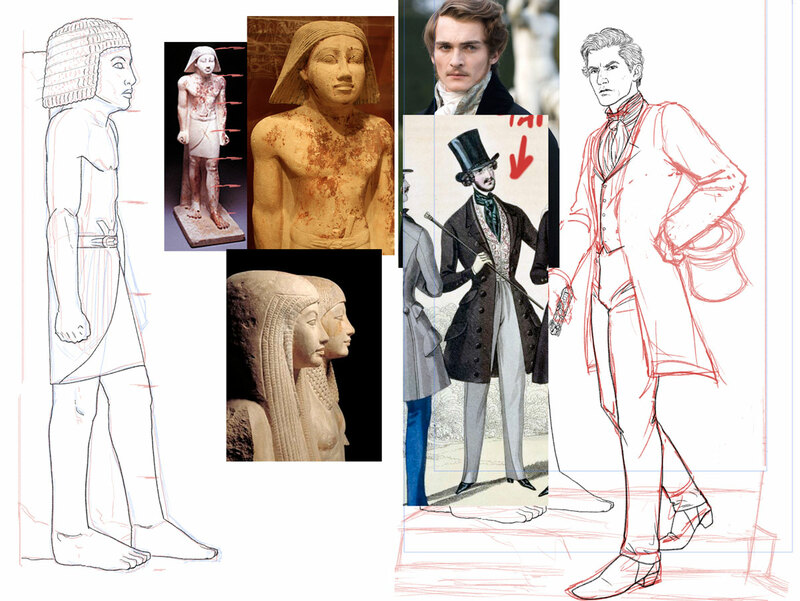 Here’s my reference and my initial drawing of the statue. The head was later re-done as the perspective needed to be as if looking up at the statue. I have quite a lot of costume reference for the Victorian period but – much to my annoyance – I discovered most of it was focused on 1860 to 1900 while the story is set in the first half of the 19th century. So I asked Gail for guidance on the exact cut of Alessandro’s clothes, and she provided me with a selection of images and I did the rest with a little sleuthing via the internet and movies. I also researched cravats and discovered that the one worn by Albert in The Young Victoria is meant to be a particularly tricky knot that was much sought after by the gentlemen of the time. That was of course what I chose to give Alessandro given his high standards. Also, his cravat is white as colored cravats had not really become a thing yet. You may ask, why go to all this trouble? Well, I feel that if a fiction is grounded in actual history, you owe it to the reader to not blow their suspension of disbelief by dressing someone incorrectly for the period. Of course, I may have gone further than was strictly necessary but I enjoy being as accurate as possible and frankly the research is fun. Working digitally also meant that I could slightly rearrange the compositional elements if I needed to. When I first started laying out the composition we didn’t have a clear solution to the story’s exceptionally long title. For maximum flexibility every part of the rear wall was painted and Alessandro and the Ka Statue remained in their own layers until the very final iterations of the cover. 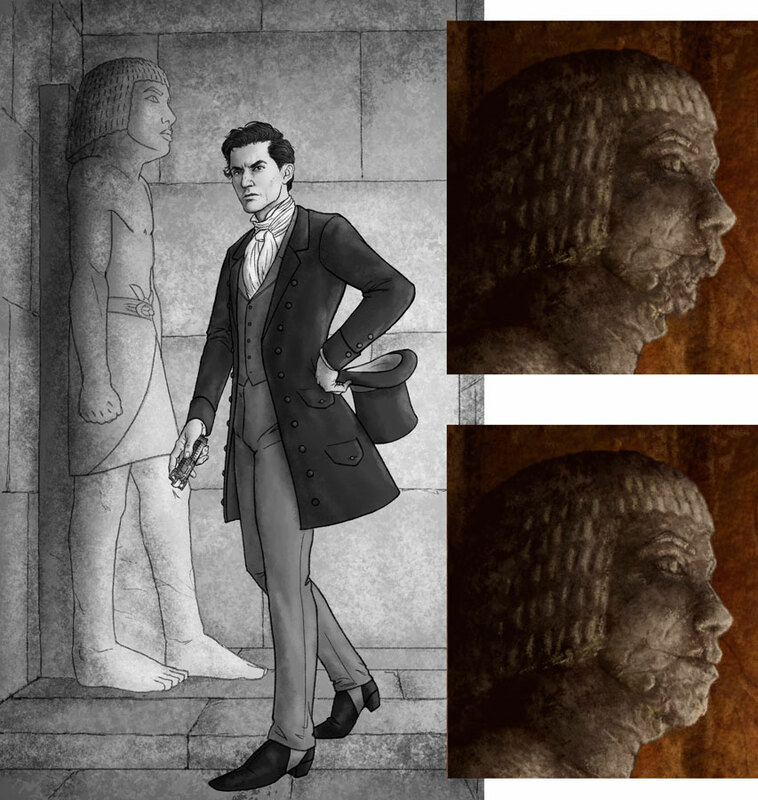 Indeed, if you look at these last two steps in the cover’s creation, you’ll see that Alessandro’s position relative to the wall and the statue have changed. This change was made so that the title wasn’t so cramped against the upper edge of the image while at the same time the title didn’t completely obscure the statue’s face. In addition, the final layout placed the focal character off-center which is consistent with the compositions of four of the five Parasol Protectorate books. Finally, here is the finished painting in its entirety. I completed the entire image rather than just the area used for the cover as I have Gail’s permission to produce this as a limited edition print of a hundred. Details on how to get the print will be coming soon. Footnote: Sand can be a real pain to paint. It’s incredibly difficult to find that sweet spot where its edges aren’t too soft, too firm or too granular. Sometimes – oh, who am I kidding, often – it’s the little things that’ll drive you crazy. I’ve been quiet for awhile, dealing with real life, working on projects or proto-projects I can’t discuss. The Maze of Games Puzzle novel which was funded on Kickstarter last year is finally shipping to people. The book is quite something to behold as it’s a quality book – bigger, heftier and more decorous than I expected – filled with some seriously tough puzzles. I admire anyone who can get through to the last quarter of this book without their brain exploding. I don’t have a copy to show right now but I can offer you this brutally quick flip-through by the book’s author, Mike Selinker. Next week people who are in the Greater Seattle area can actually pick up their books from one of three events listed in this Kickstarter update. Now, if you backed the Kickstarter campaign you probably already know this. However those of you that haven’t but still want the book should know they’re all public events and there will be some additional copies for sale. But the big Maze of Games news for the week is that there’s going to be an accompanying audiobook, narrated by Wil Wheaton who apparently really threw himself into the 40+ character voices. The audiobook will be the focus of a new Kickstarter campaign that’ll be starting soon. I’ll be sure to announce it on various social media right after Mike does. The book announcement and links to where to get it are in this blog entry on Gail’s site. This is actually only a portion of the image. There’ll be more about the cover posted here and on Gail’s site in the very near future. 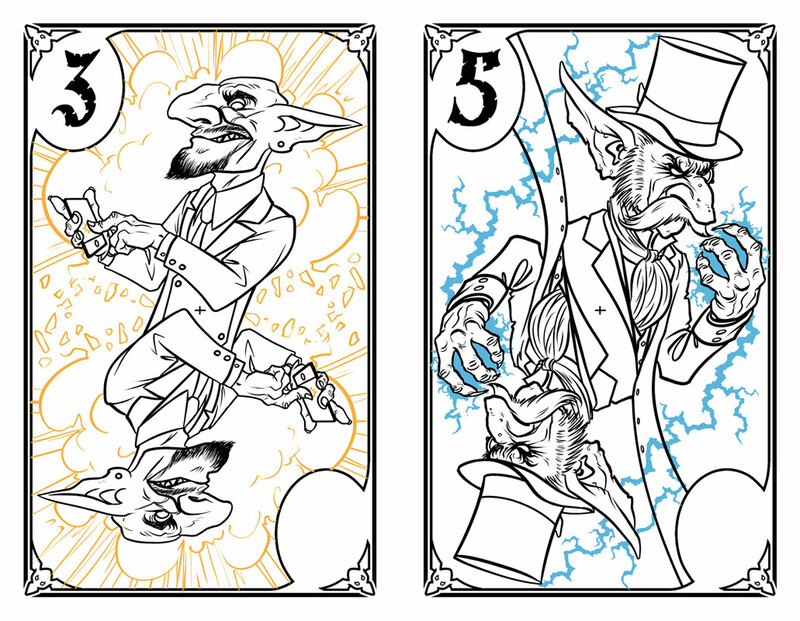 Here’s the line work to four more of my “Goblins Through the Ages” cards for the Pairs Kickstarter. #3 is the modern day card who’s kind of a conglomeration of a bunch of the world’s ills these days, but I just think of him as the “Bond villain”. 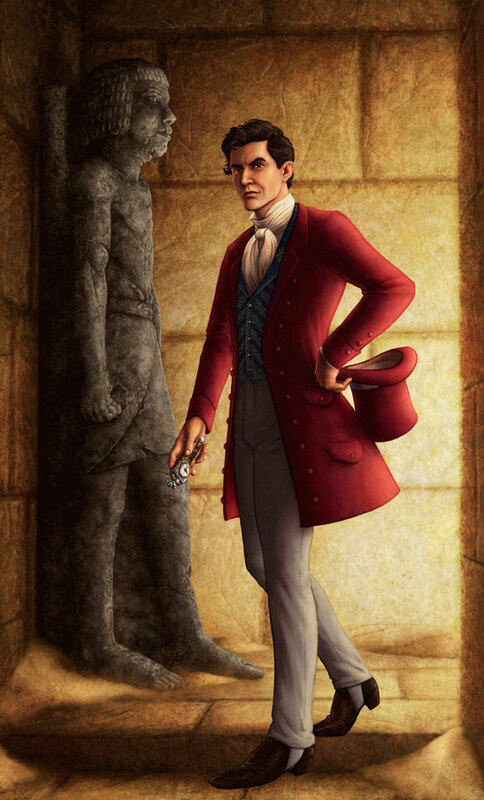 #5 is a Victorian Occultist or is that starting to get redundant?! #7 is some Robin-Hood style goblin. #10 is the lowly prehistoric Cave-Gobbo. The Pairs Kickstarter. has a week left to run. If you want one of these decks you better jump onboard as they won’t be available afterwards. Kickstarter has been a big part of my life this last year. Exactly a year ago today, The Gathering launched on Kickstarter. The book was greeted enthusiastically and has gotten some glowing reports from the backers who’ve gotten ahold of it. But it’s still not done as the limited edition book and the card set are still wrapping up. Yeah, working on it a year later really wasn’t part of the plan. Them’s the knocks. At the same time in Feb 2013, The Maze of Games Kickstarter was in full swing. For that book my primary involvement was producing the artwork. The 40+ illustrations created are why Summer 2013 was something I heard about but didn’t really experience. That book should be printed by now and wending its way to the US from overseas. Well, apparently I just can’t get enough of Kickstarter because I’m currently involved with James Ernest’s new “pub game” Pairs. It’s called a “pub game” because it’s something you can learn in 3 minutes and can join or leave at any time. It’s the ultimate in casual gaming. What impresses me most is its elegance; simplicity without sacrificing strategy. Props to James and his co-designer Paul Peterson. The Kickstarter reward tiers are for numbers of decks, but not specific ones. A little while after the Kickstarter wraps, backers will receive a survey where they can pick which ones they want from those unlocked by the stretch goals. 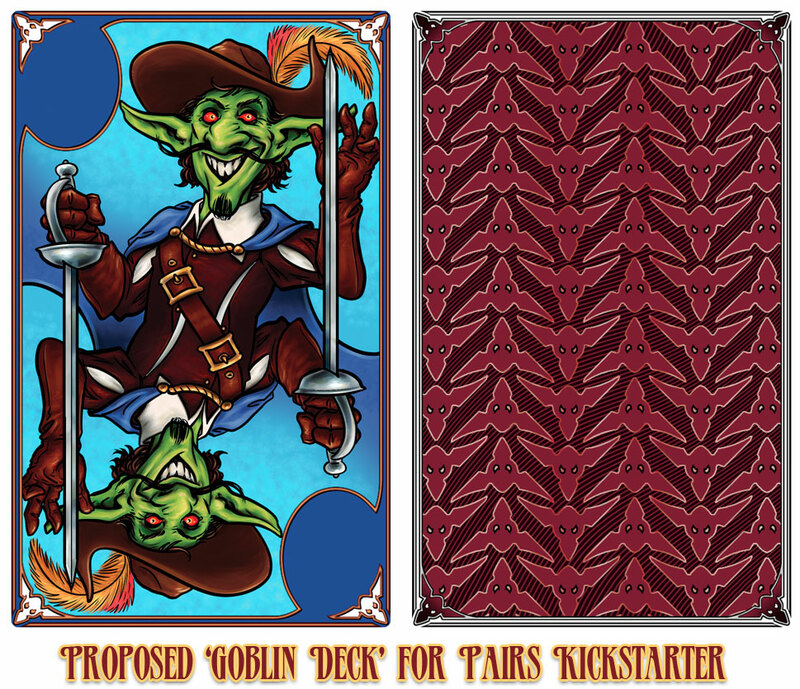 Mine’s not unlocked yet, so please help back the project reach (at least) $100K and ensure this goblin deck gets made! 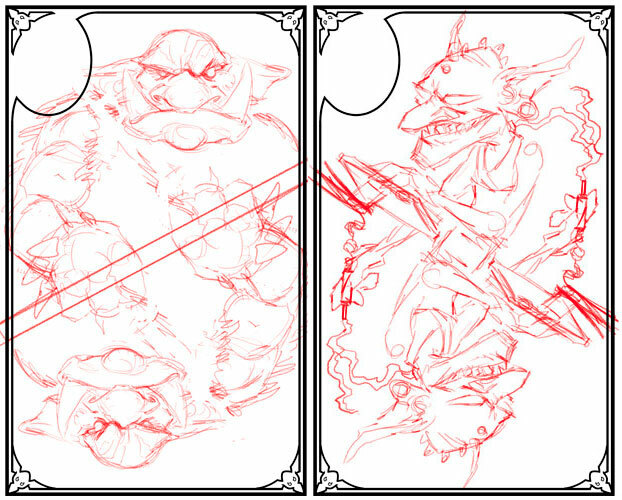 Finally, here’s a few sketches of other potential goblin cards – the prehistoric goblin and the cyberpunk goblin! Yeah, could be lots of fun. 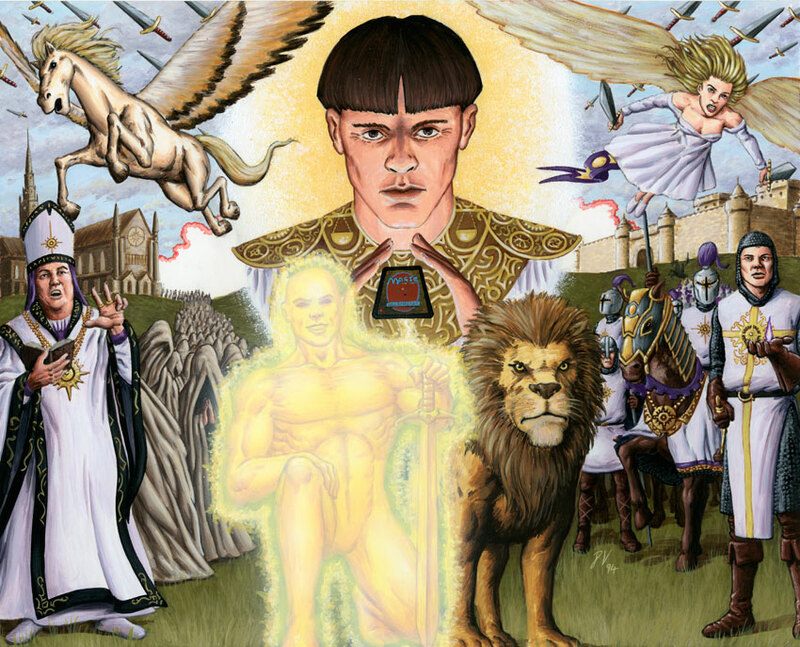 On Oct 10th, 1993, at Philadelphia Comicfest, I first met Magic art director Jesper Myrfors. I’d actually been trying to catch up with Richard Thomas, art director of White Wolf Games, and when I finally tracked him down he was with Jesper and both of them were happy to take a look through my portfolio. It’s fair to say that little piece of happenstance was the biggest career-changing event in my life… thus far. Both of the art directors liked my art but it was Jesper who followed through with work. Two weeks later I was painting my first Magic card, by April 94 I was making my second-ever trip to the U.S. to visit Wizards of the Coast. In June 95 I moved to Seattle and worked full time at Wizards on the Magic backstory and met a great deal of new friends (many of whom I still know today), and my lovely Jilli who became my wife in Oct 97. And all because of my timing at Comicfest 93. Ah, it all makes me a bit melancholy thinking back on those crazy early days of Magic. There was that crazy rush of something new and unprecedented. Magic tournaments are still fun to attend but the electric buzz of those first few years can’t be beat. 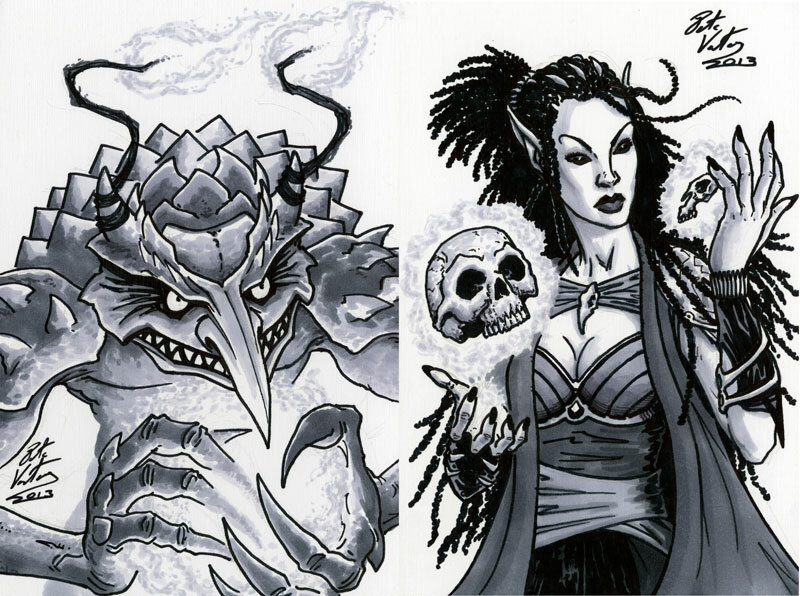 I’ll leave you for now with a look at a couple of the sketch cards I produced for The Gathering Kickstarter. In 1994 I created a set of promo pieces timed for Magic: The Gathering’s first anniversary. Unless you’re one of about a dozen people, these are all completely new to you. To find out why, check out the prologue to this series. And so, this unveiling rolls around to its conclusion with probably my favorite color in Magic. It’s time for Black! This also happens to be my favorite of the six promo pieces. I think one of the biggest reasons is that the figures are more dynamic than in most of the other images. That’s a little down to my card choices but given that Black is at home in the shadows or under a night sky but is populated by a legion of often pale, sometimes bloody and vivid creatures, the image’s strong contrast was never going to be hard to achieve. I hope the tour through these images has been fun for you. I’m really glad I finally got to share them. My time working for Magic may have passed but I loved the game, helped build the world (somewhat literally as I designed the globe of Dominaria), and I’ll always be grateful to Magic’s first art director, Jesper Myrfors, for giving me a shot and helping bring my artwork to a worldwide audience. Thank you all for the comments and compliments. It’s been a blast. Next time: …who knows? Maybe something created more recently than 19 years ago! 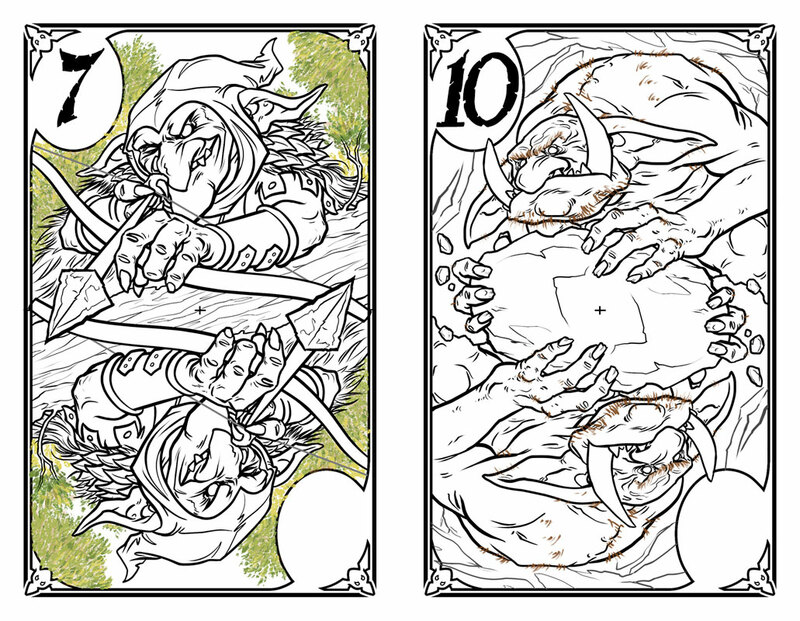 The answers to the cards used in this piece are below, followed by a quick FAQ. Peer into the abyss of Black answers. Oh, and the FAQ. Here’s the fifth in a series of promo pieces I did for Magic, waaaay back in 1994. They’ve never been seen in public before but it being M:TG’s 20th anniversary it seemed like a good time to share them with you. 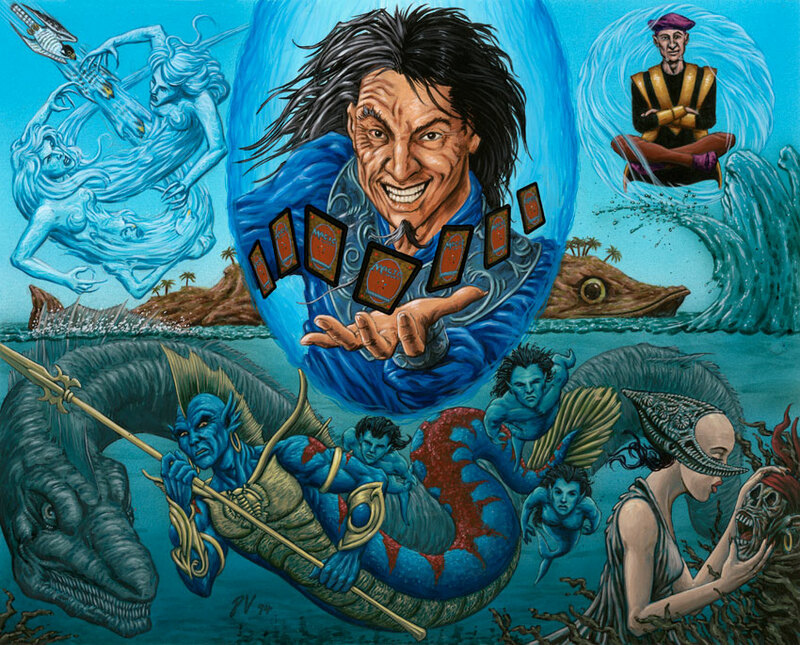 Blue magic in 1994 featured a lot of air and water themed spells. In addition it’s the color of pure arcane knowledge, illusions, counterspells, and control (of creatures and time itself). It also felt like Blue Magic would be the color most used in the creation of artifacts, a position enhanced by the fact that Blue sits opposite the natural fecundity of Green. It’s seems like a wildly random set of spheres of influence. Perhaps the catch-all for ideas that didn’t fit elsewhere. Or perhaps that’s my prejudices showing as Blue was my least favorite color to paint cards for. Take a shot at guessing all the cards tucked away in this piece. As usual, the answers are below. All of Blue’s esoteric knowledge lies within. Did divine inspiration strike? Here’s the answers to White. The story so far: In 1994 I created a series of promo images for Magic: The Gathering. These pieces were meant for flyers timed for the ’94 con season, and the game’s first anniversary. The project was to be six images, one for artifacts, and one for each color of mana. Green, being nature, doesn’t struggle with right and wrong. Much like its opposite number – Blue – its essentially amoral. 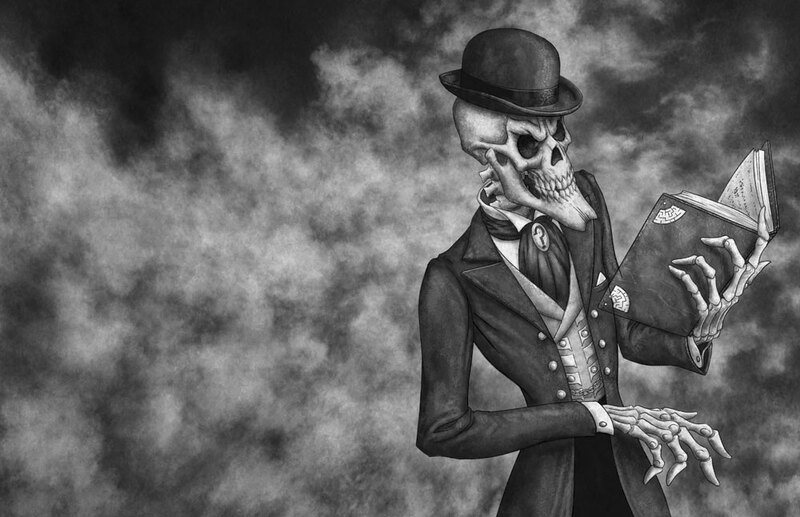 And while Green is life and its other opposite on the color wheel – Black – is death, Green recognizes that death is part of the cycle of life and Black has a little life in it due to various unpleasant biological systems involved in putrefaction. Yum. 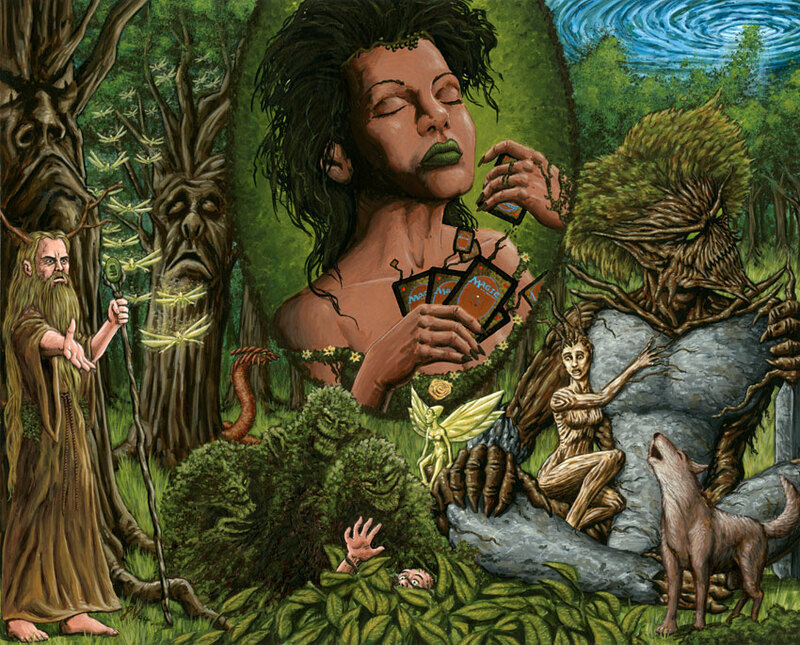 Anyway, the planeswalker here shows a little of Green’s Tranquility while the main image focuses on the amoral side. Have fun locating all of the cards in the image. The answers are posted below. Next time, we’re onto White. Click through for all the answers to your thorny questions. The story so far: In 1994 I created a series of promotional images for Magic: The Gathering. These pieces were meant for flyers timed for the ’94 con season, and the game’s first anniversary. 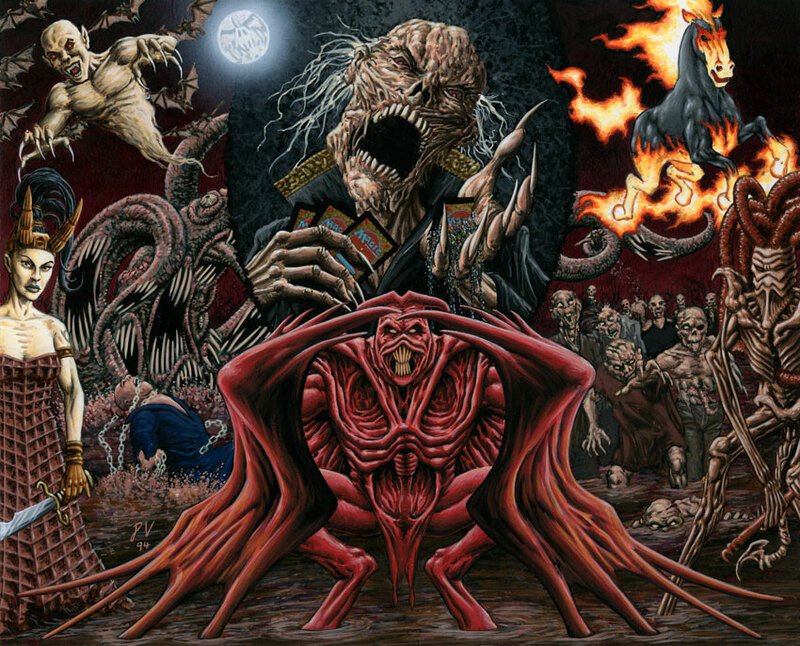 Since Red is – among other things – the color of chaos, it seemed fitting that the creatures would be fighting amongst themselves, and of course firing off highly destructive red spells. This is only the second time I ever painted goblins, the first time being the binder image shown in the prologue. Goblins, of course, have become a staple of Magic and a feature of my own career in the game. Back in ’94 the logical opposite to the goblins seemed to be dwarves, but by 2013 it’s fair to say that dwarves aren’t really a big component of Red and are thoroughly, exponentially, outnumbered by goblins. If I was creating this today, the dwarves probably would have been replaced with another race. Red is also the color of fire and flame is especially tricky to paint with non-digital media. Generally, you need to get it right first time because the underlying white of the paper is vital to producing sufficient luminosity in the flame. I hadn’t quite learned that lesson yet but that’s the thing with any creative profession; you’ve got to make the mistakes to improve. Burning questions? Okay, I’ll stop now, here’s your answers.